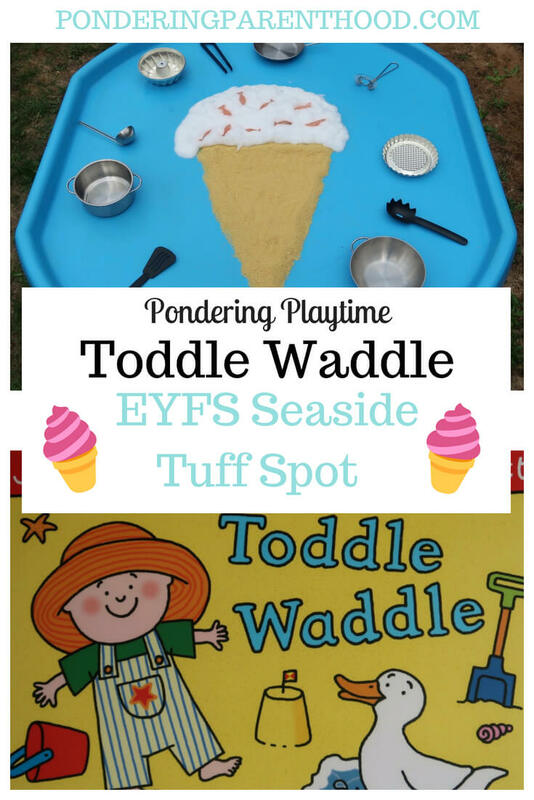 Toddle Waddle by Julia Donaldson*, and a fun seaside themed tuff spot activity to go with it. 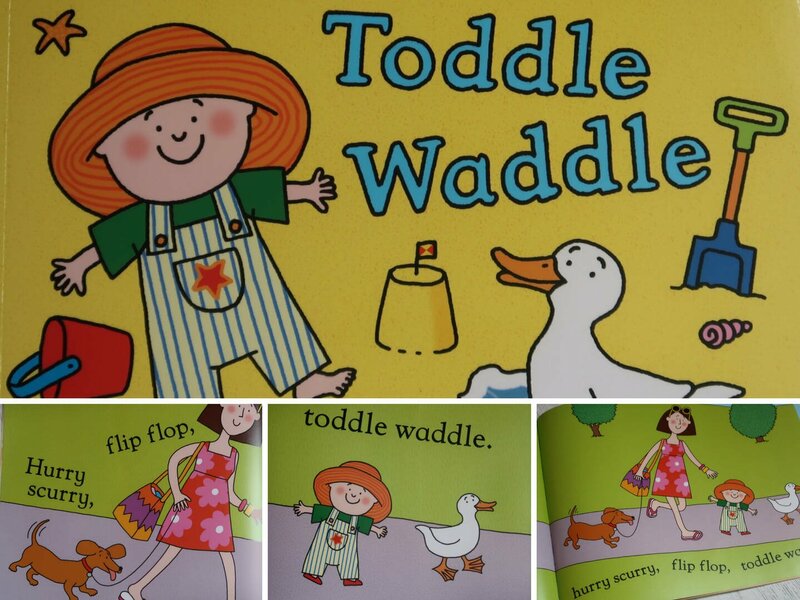 Toddle Waddle – What’s the Story? Toddle Waddle is a simple picture book full of rhyming words and onomatopoeia (words that sound like the thing they represent, for example, whoosh or buzz). In Toddle Waddle, a toddler, a duck and an ever-increasing menagerie of other people and animals take a trip to the seaside. 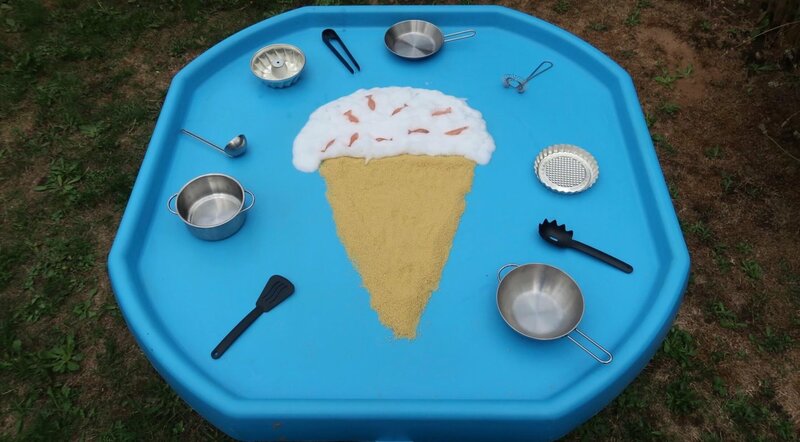 For this seaside-themed activity, I set up M’s tuff spot with a big picture of an ice cream. I made the ‘cone’ with a cheap packet of uncooked couscous, sprayed foaming soap from the pound shop to make the ‘ice cream’ part, then ‘decorated’ it with fish-shaped ice cubes coloured with red food colouring, to make them look pink. 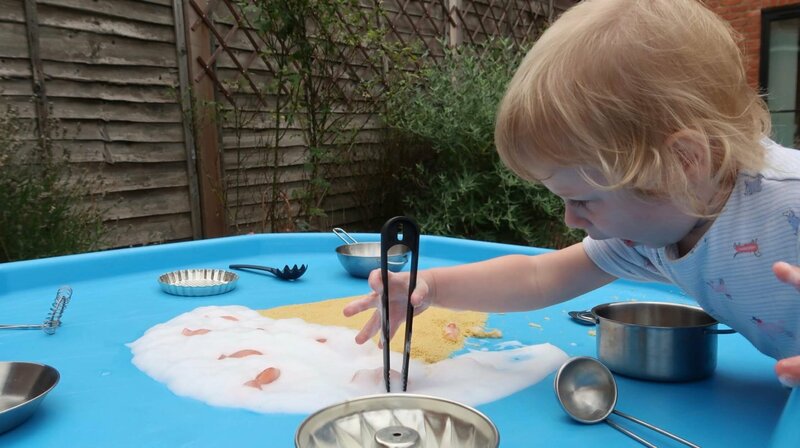 I’ve included a pair of play kitchen tongs which are very similar to the tweezers found in EYFS classrooms. These are great for developing fine motor skills and getting little fingers ready to hold pens and pencils. 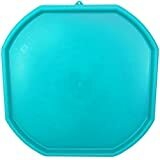 The set of play kitchen utensils from Ikea includes the ones that we used. I also put out lots of the pots and pans from Ikea’s toy cookware and baking sets. I thought M might like to ‘cook’ with the ‘ingredients’ from the pretend ice cream. M enjoys this book so much that the last time we read it together, she insisted on hearing it three times in a row. There’s a lovely sense of rhythm and musicality about it as you read, so it’s a pleasure for adults to read, too! M had a whale of a time doing this seaside themed tuff spot activity. She started by collecting up all of the ice fish and putting them in a pan. I showed her how to use the tweezers to pick up the ice cubes, and she had a really good go at it. 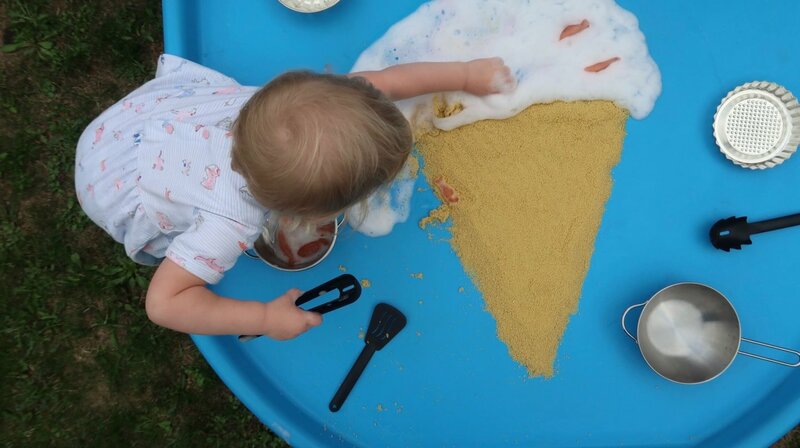 Her favourite thing to do, though, was to make ‘mud pies’ with her pots and pans. 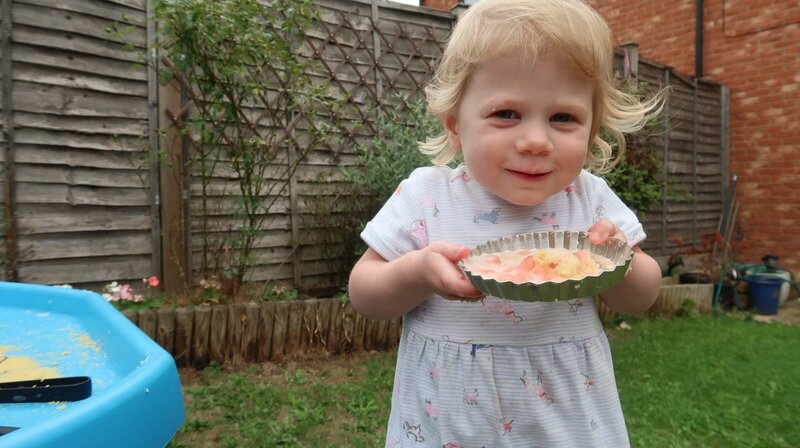 She spent ages mixing, pouring and whisking, and was so proud of her creation. "Ponderings on Two – Advice from Emily and Indiana"